SALEM, Ohio — Carroll County led Ohio with the highest number of shale oil and gas drilling permits issued during January. And again, Chesapeake Exploration was the company behind the nine permits in Carroll County. The majority of the permits were issued in Lee Township and two were issued in Loudon Township. According to the Ohio Department of Natural Resources, there are now 142 wells producing in Carroll County and 146 are drilled, waiting for pipelines or to be hydraulically fractured. Another 82 permits are awaiting the next step in the drilling process. Another county that is shaping up to be a leader in the Utica shale is Harrison County. There were five permits issued in January, three permits issued in North Township to Chesapeake Exploration, and two in Moorefield Township to the Gulfport Energy Corporation. There are now 44 producing wells in the county, and 70 wells are in some sort of drilling stage, according to the ODNR. The Gulfport Energy Corporation has plans to drill even more wells in Belmont County. According to the ODNR, three permits were issued in January to Gulfport Energy Corporation for wells in Somerset Township. 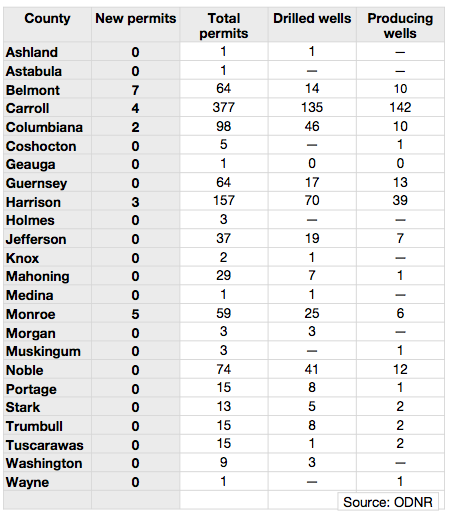 There are now 11 wells producing in Belmont County and 17 are drilled, according to the ODNR. There are 45 additional well permits waiting for drilling to commence. In Monroe and Noble counties, the ODNR issued two permits in each county during January. In Monroe County, two permits were issued to Antero Resources Corporation in Seneca Township. As of the latest information available from the ODNR, there are seven producing wells in Monroe County and 24 others in some sort of drilling phase. There are 30 permits for wells awaiting drilling to begin. The ODNR reported there were two permits issued in Noble County’s Seneca Township to the Antero Resources Corporation. There are now 16 producing wells in Noble County and 41 are drilled awaiting the fracking process or pipeline construction. There are an additional 19 permits awaiting drilling to occur. In Washington and Columbiana counties, one permit was issued in each county. A single permit was issued in Aurelius Township in Washington County to Triad Hunter. According to the ODNR, there are four producing wells and two wells that are drilled in Washington County. A single permit was issued to Chesapeake Exploration for a site in Franklin Township in Columbiana County. In Columbiana County, there are now 19 producing wells and 40 drilled. In addition, the ODNR has issued 39 permits for wells that are awaiting well pad construction and drilling. The ODNR also issued a Marcellus shale well permit for Washington County’s Ohio Township in January. The permit was issued to StatOil USA Onshore Property Inc. 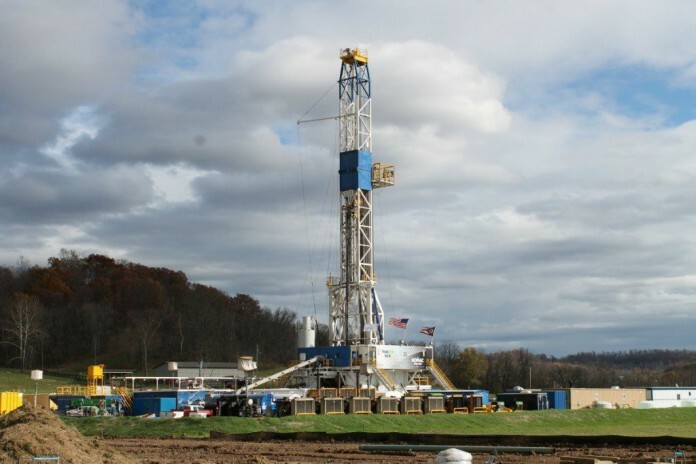 There are now 18 Marcellus shale wells drilled and 34 permits, according to the ODNR. There is one rig drilling in the Marcellus shale. In the Utica shale, there are 40 drilling rigs. The ODNR reported there are now a total of 1,061 permits issued and 697 wells drilled. According to the Pennsylvania Department of Environmental Protection, there were 123 wells drilled in Pennsylvania during January. Washington County had 31 permits issued and Greene County was not far behind with 29 permits issued. Susquehanna County led the state of Pennsylvania with 48 permits issued in January, and sites in Bradford County received 26. The DEP issued a total of 2,675 permits for drilling in 2013. The West Virginia Department of Environmental Protection issued permits for drilling in the Marcellus shale in three counties. Permits were issued in Wetzel County to HG Energy, for two wells on the farm owned by Bernard Lee Yoho Jr. In addition, permits were issued in Tyler County to Jay-Bee Oil and Gas for three different properties. The permits were for sites on farms owned by Emma and Brent Weimer, Lois and Arthur Bloom and Keith M. and Juanita L. Weedon. There were two permits issued to each farm. A permit was issued in Preston County to EnerPlus Resources Corporation for a Marcellus shale well site on a farm owned by Vera C. and Francis Colebank. I have heard they are leasing in that area. However, there have been no drilling permits issued that far west in Ohio. There have been differing models about the shale deposits. None of them have showed anything in that area yet. Kristy, do you know anything about the four Milliken wells in Harrison County owned by Gulfport? We are property owners but live out-of-state and it is difficult for us to keep up with the news. Can’t seem to learn anything from ODNR web site. Thanks for your help.